This is a Korean name; the family name is Oh. ↑ Hye-jin, Jeon (July 11, 2016). "[인터뷰①] '38사' 오대환, 이렇게 짠내나는 나쁜놈 본적 있수". Sports Chosun . Retrieved 2017-03-26. ↑ "[공식입장] 오대환, '리턴' 출연 확정..첫 의사 도전". Osen (in Korean). November 27, 2017. 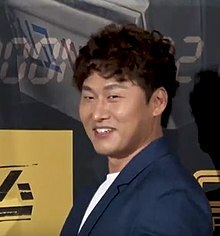 ↑ "[공식입장] 오대환, OCN '라이프 온 마스' 주연 합류…정경호와 호흡". News1 (in Korean). April 10, 2018. ↑ "[공식입장] 이경영·오대환·원, '나인룸' 합류…김희선·김영광과 호흡". News1 (in Korean). August 14, 2018. ↑ "오대환, '특별근로감독관 조장풍' 합류…악덕 사장 役". Naver (in Korean). Tensia. Retrieved January 26, 2019. ↑ "[제23회 춘사영화제]나나X오대환, 특별인기상 수상 "더 발전하는 배우되겠다"". Herald Corporation (in Korean). May 18, 2018. ↑ "2018년 제 26회 "대한민국 문화연예대상" 성황리 개최". NB News (in Korean). November 29, 2018.